Following the release of her debut EP Ultraviolet just over a year ago, Norwegian pop princess Dagny opened the show with raging vocals, matching jumpsuits, and powerful mood lights. Starting with title track ‘Ultraviolet,’ then moving into my personal favorite ‘Fool’s Gold’ where the studio version includes a feature from equally dreamy pop star, Børns. Dagny’s voice consumed the venue from the front row all the way out to the entrance of the music hall. After playing new single ‘Love You Like That,’ she ended her 30-minute set with popular ‘Backbeat’ and ‘Wearing Nothing’. Her catchy beats and stunning range, Dagny is going to be BIG; don’t sleep on this girl. Not even a minute after 9, a woman’s voice was telling me that this was going to be the greatest night of my life, and all I said in response was, “bet?”. Instantaneously, hundreds of phone screens emerged from the crowd as Jake Gross, Les Priest, and Paul Klein took the stage and kicked off the show with ‘Dumb Stuff,’ the first track on their new debut LP. After years of EP and single releases, LA based indie pop trio LANY have finally released their debut self-titled album. With the success of their heart-wrenching pop gem ‘ILYSB’, LANY has been on the minds of music lovers everywhere. LANY is reminiscent of acts like The 1975 and The Japanese House while still crafting an album that is without a doubt their own. From start to finish, LANY’s self-titled explores the broken heart of emotional LA ex-model, Paul Klein. One of the best aspects of the band is their ability to utilize recurring synth sounds throughout their songs without sounding repetitive. The final product is a sonically cohesive album that begs you to listen for the entire 56 minutes. 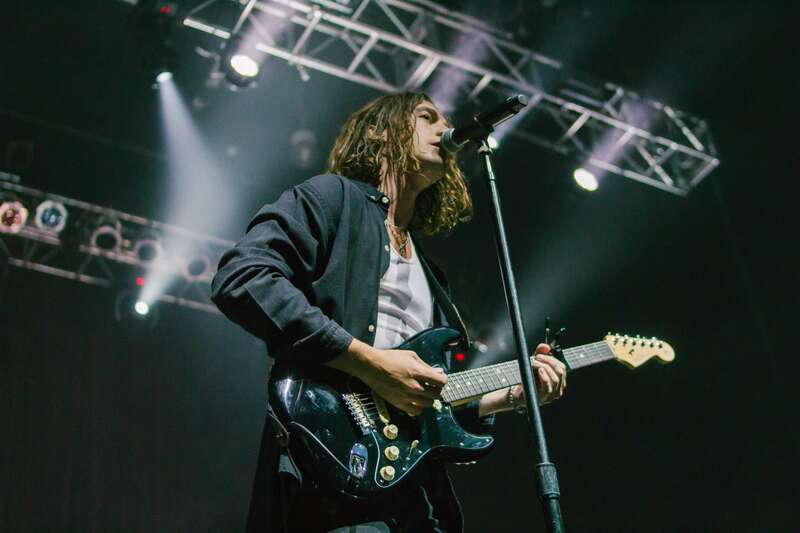 LANY managed to curate a set list that incorporates both their self-titled album as well as hits from their past projects like ‘4Ever!’, ‘Pink Skies’, and ‘Made in Hollywood’. Between the simple monotone lighting and the smooth, gut wrenching synths, Klein told us the story of his emotional break up – an open book singing on stage. The emotion in his voice was center to none and never lost its intimacy. At times, I thought the band leaned too heavily on their slower ballads, which all had one common theme: Klein’s broken heart. While they performed beautifully and full of emotion, it was hard to keep the intensity up throughout the concert. I began to miss the bright colored syths and the screaming choruses. As the band continues to grow into larger venues, I can only imagine the energy they will create with future albums and shows. The encore reminded me of why I fell in love with this band. With a single note from the intro to ‘Super Far’, the energy in the crowd exploded. “If this is love, then I don’t want it.” The contagious chorus is being chanted from every pair of lips in the venue as if coming to the collective realization that it is time for Klein and his broken heart to finally move on. A brief voicemail is played from one of the band members parents (aww) and they explode into what everyone was waiting for. Their hit ‘ILYSB’ ended the night in an optimistic and refreshing burst of emotion. Paul said it himself, “we may not be the biggest band in the world, but no one wants it more than us.” They definitely proved it at the House of Blues.